If you dream of world-class fishing, in pristine waters surrounded by untouched natural splendor, the Cariboo Chilcotin Coast region (map of region) of British Columbia is a place you will want to visit. This region offers several thousand lakes teaming with wild Rainbow trout. Hundreds of miles of coastal inlets are home to Chinook, Coho, Sockeye, Pink and Chum salmon, not to mention huge halibut, lingcod, and rockfish. Countless miles of rivers and streams bearing names such as The Dean, Atnarko, Bella Coola, Kwatna, Chilco, Taseko, Chilcotin, Quesnel and Blackwater are beckoning to be explored. It almost sounds too good to be true! The Cariboo-Chilcotin-Coast has truly earned a reputation as one of the richest sport fishing areas in the world. Dreams do come true in this part of BC and if your dream involves tying into a chrome-bright trophy steelhead, look no further than the legendary Dean River (map of Dean River). The Dean River, a coastal BC wilderness river that many anglers believe to be the finest summer run steelhead stream in North America. The Dean River starts its life in Nimpo Lake flowing out as a small stream. It begins to meander slowly to the northwest and into nearby Anahim Lake. It then continues onward past Abuntlet and Lessard Lake towards Tweedsmuir Provincial Park. This upper headwater section of the river to Abuntlet Lake is accessible by boat and is best known for its resident wild rainbow trout. Services and facilities, which include many fine resorts and lodges, can be found in the nearby communities of Nimpo Lake (referred to as the float plane capital of BC) and Anahim Lake. Once inside Tweedsmuir Park, the Dean River turns to the west, travelling downward through the Coast mountain range to the Dean Channel and out into the Pacific Ocean. The lower portion of the Dean, from the mouth of the river to Crag Creek, is the salmon and steelhead section and can only by reached by boat via Dean Channel or by air. 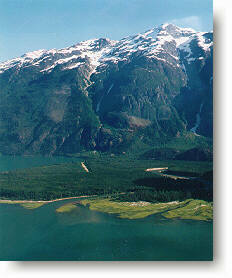 Air charters to the Lower Dean are based at the nearby communities of Nimpo Lake, Anahim Lake, and Bella Coola. Flights can also be arranged to fly directly from 100 Mile House, Williams Lake and Quesnel. Daily scheduled flights connect Vancouver to Williams Lake and Quesnel (with an airtime of approximately one hour). Another interesting route to the Dean is travelling by ferry from Port Hardy on northern Vancouver Island to Bella Coola and then chartering a boat, plane or helicopter to the river. If you feel like seeing a lot of country and spending a couple days doing it, travelling by land is definitely the way to go. From Vancouver you can take a wonderful back country ramble by travelling north on Hwy. 99 through the resort town Whistler, and then continuing on past Duffy Lake which will lead you into Cariboo country at Lillooet. Continue east from Lillooet on Hwy. 99 and you will run into Hwy.97, where you will turn north and travel on to Williams Lake, "the Hub" of the Cariboo. Approximate travel time is 7 hours. Williams Lake can also be reached by taking the primary route, which is the Trans Canada Hwy. 1 from Vancouver to Cache Creek. 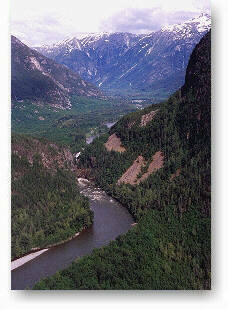 You will travel through the spectacular Fraser and Thompson Canyons. From Cache Creek travel north on Hwy. 97 to Williams Lake. This route is 540 km./335 miles in length, with an approximate travel time of 6 hours. Nimpo Lake, Anahim Lake and Bella Coola can all be reached by travelling west on Hwy. 20 from Williams Lake. Hwy. 20 will take you from the Cariboo through the Chilcotin and down to the coast at Bella Coola. Williams Lake to the headwaters of the Dean at Anahim Lake is approximately 317 km./196 miles with a travel time of about 4 hours. 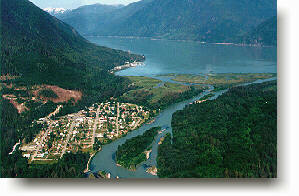 Bella Coola can be reached within 2 hours from Anahim Lake by travelling west on Hwy. 20 for another 140km./86 miles. Approximately 287 km./178 miles of Hwy. 20 is paved while the remaining 176 km./109 miles consists of well maintained gravel road. One note of caution: At Heckman Pass located just inside Tweedsmuir Provincial Park you will be at an elevation of 1524meters/4999feet. 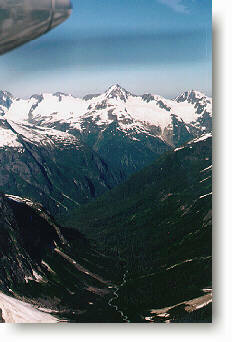 From this point you will begin descending into the Bella Coola Valley,which is at almost sea level. At one point during your descent you will encounter "The Hill", which consists of one 9km./5.6mile section of narrow gravel switchbacks, with grades up to 18% . Travellers should use low gear and proceed with caution. There are pull-overs along this stretch to allow room for large transport trucks to pass and for you to cool your brakes if needed. You should expect excellent road conditions from May to October. From mid October to March you can expect snow. April is spring break-up. The trip from Vancouver to Bella Coola is an adventure and is truly spectacular with countless Points of Interest along the way. A variety of anadromous and resident sports fish are available in the lower Dean River, including a fine Chinook salmon run that starts in June and continues through to mid-July. But no matter how good the salmon fishery is, the Dean River will always and forever be best known for its fabulous summer steelhead. The Steelhead enter the river at two different times. First is a late spring run bound for the Takia River, a main branch of the Dean, approximately 72 km./45 miles from the ocean. The second run enters the Dean a few weeks later and are considered the Dean River Main fish as they will spawn in the Dean itself. Many consider these fish to be 2 distinct races of steelhead long separated by their headwater destinations. Certainly this could be true, however it has yet to be proven. Many anglers believe the Dean River to be the strongest of all steelhead. One explanation that could account for their strength is the great physical effort that is required to overcome the falls on the lower Dean. Another reason is that the majority of the Dean River's steelhead enter freshwater approximately the same time the steelhead enter the Skeena River bound for the Kispiox, Sustut, Babine and Bulkley rivers. 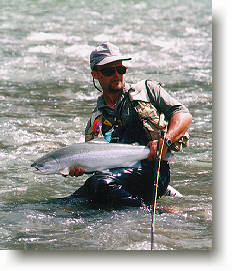 The Dean River is a July and August fishery while the Skeena River tributaries are best known for their fall fishing. This means two things: first, the Dean River runs are immediately available to fishermen, sometimes only hours from the ocean and their condition is superb. Often sea lice are still found on these chromers when caught. The fish found in the upstream tributaries of Skeena have been in freshwater a long time before they become available to fishermen and are often colored and sluggish despite their great size. 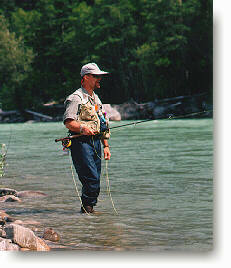 Second, when the Dean River fish enter freshwater they are fished during the warmer water conditions of summer. 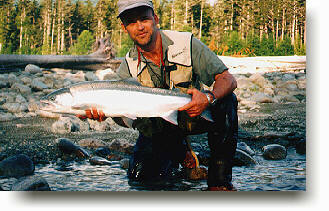 Steelhead are far more active and aggressive when the normally frigid waters are warmed in early summer. These fish are definitely not shy! They hit the fly hard! Kispiox, Babine, Sustut and Bulkley runs are fished in cooler water during a cooler period of the year. This acts like a damper on the steelhead's metabolism. The fish slow down and become more lethargic as the water gets colder. Whatever the reason for their great strength, the Dean River steelhead have fulfilled many a fisherman's dream of an ocean fresh trophy fish. The best time to fish the lower section of the Dean (from tide water to the lower canyon located about 3km./2miles upstream) is from mid July to mid September. The last week in July to September 1 is considered the best time to fish the upper section (from just above the lower canyon to Crag Creek). Excellent drifts are found in the upper section from Kalone Creek down to the lower canyon. The first 5 miles of river can be accessed via gravel road. There is no road access from that point on, however jet boat transport can be arranged to carry you and your supplies to the upper drifts of the river. Guiding services are available and can be arranged before reaching the Dean. Camping is allowed along the river banks, however there are some resorts located in the lower portion of the Dean. The Dean River is a treasure and is considered one of the best managed rivers in the world. Special regulations are in place, including fly fishing only sections. Before heading to the Dean, anglers should consult the current BC Freshwater Fishing Regulations Synopsis or contact the Cariboo Ministry of the Environment Office located at Suite 400, 640 Borland Street, Williams Lake, B.C. V2G 4T1, phone (250) 398-4530.